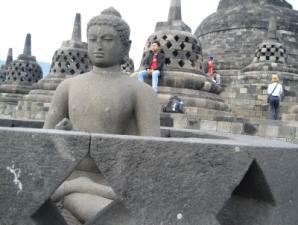 Borobudur temple is one of the greatest Buddhist monuments in the world. This colossal relic of Borobudur was built by Sailendra dynasty between 778 to 842 AD; 300 years before Cambodia’s Angkor Wat, and 400 years before works had begun on most great European cathedrals. Little is known about its early history except that a huge workforce project - sculptors, artists, statue and carving experts - must have been labored to move and carve the 55,000 cubic meters of stone. 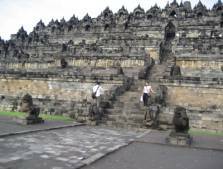 This Borobudur historic site is a cultural legacy and becomes major sources of Indonesian culture, which is located about 40 km north of Jogjakarta City in central part of Java island. Sir Thomas Stanford Raffles revealed the temple in 1815. He found the temple in wined condition and buried under volcanic ash. He ordered an archaeologist, H.C. Cornelius to excavate and clear the site from undergrowth and to do thorough investigation. More than 200 laborers were occupied for 45 days to uncover and remove earth, bushes, and trees which buried the historic temple. A massive restoration project began from 1907 to 1911 led by Dr. Tb. van Erp. 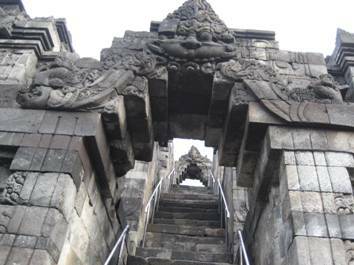 Later, with the help of UNESCO, and second restoration to rescue Borobudur was carried out from 1973 to 1983 (Gunarto, ref. #1). Since then, it became UNESCO World Heritage and Treasures. Usage period: approximately 200 years. 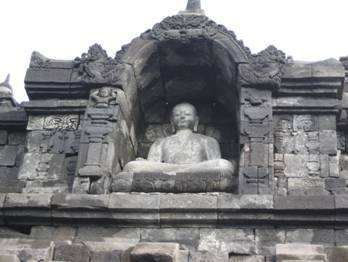 As one of major centers of Buddhist scholarship in South and South-East Asia during those time, Borobudur temple was built with an overwhelming mass of images and galleries on its walls depicting the activities of Gods. There are more than 1,400 narrative panels illustrating the life of Buddha and Buddhist texts, the largest and most complete collection of Buddhist relief in the world. These religious illustrated texts consist of 6 different doctrines and visual artworks: Karmavibhangga, Lalitavistara, Jatakas, Avadanas, Gandavyuha, and Bhadrachari. In order to read all these manuscripts, we have to start our tour from East Gate on gallery 1 circulating to the left, following round 1, 2, 3, …, 10, as shown in the following table. This is the way how Buddhist monks proceed on the ritual ceremony during their Holy festival Day. Karmavibhangga is the first manuscript describing the doctrine of cause and effect of good and evil. This series of relief is not visible as it is surrounded by broad base of stone walls. Only parts of the southeast side were dismantled for visitors (panel number 19, 20, 21, and 22). Second visual manuscript, Lalitavistara represents the life of Buddha Gautama from his birth until his first Sermon at Benares. One full round on the first gallery (upper wall only) was dedicated to this manuscript. Jatakamala or Garland of Jatakas is a collection of poems consisting of 34 Jatakas. Based on manuscript written by Aryacara in the 4th century, these Jatakas contain stories on great deeds performed by Buddha in his former lives. These episodes of reincarnations serve as example of self-sacrifice. Avadanas illustrated narrative are similar to Jatakas in which Buddha is not directly performing principal lead. These visual manuscript describe deeds accomplished by Bodhisattvas in their former lives, preparing for Buddhahood. The most important part of Buddhist world is written in the Gandavyuha, the longest manuscript described in the 3 galleries: gallery 2, 3, and 4. It describes Sudhana, son of a rich merchant, who in his aim to reach the highest wisdom, meets several Bodhisattvas. Two spiritual teachers of these are Maitreya (future Buddha V) and Samantabhadra (ultimate and eternal Buddha). 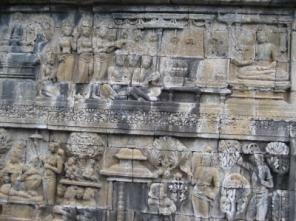 As concluding of Gandavyuha, Bhadrachari manuscript is represented in the 4th gallery (main wall). It contains the pledge of Sudhana to follow examples of the Bodhisattva Samantabhadra. representing pictures of Eternal Buddha (Boddhisattva Samantabhadra) in Tushita heaven who will come down to earth as human being. 1. Digital Preservation of Borobudur World Heritage and Cultural Treasures, Hary Gunarto, Journal of Ritsumeikan Studies in Language and Culture, VOL 19, No 2, Kyoto, Nov. 2007. 2. 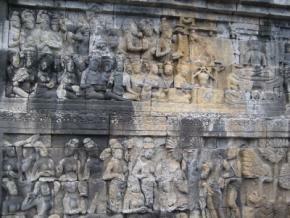 Borobudur's Narrative Relief Wall of UNESCO Cultural World Heritage, Hary Gunarto, RCAPS Occasional Paper No.07-5. October 2007, Ritsumeikan Asia Pacific University, Japan. 3. Preservation of World Heritage, Hary Gunarto, presentation on AGORAsia teleconference, UNESCO, Jakarta, December 2011. 4. Digital archive of 1907 relief, Michael Greenhalgh and Ajay Limaye, Australian National University, website accessed on June 7th 2007. This website has been visited times.